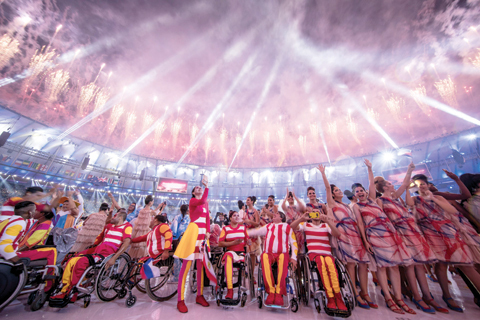 RIO DE JANEIRO: Participants react under fireworks during the opening ceremony of the Rio 2016 Paralympic Games at the Maracana stadium. RIO DE JANEIRO: The Paralympic Games opened Wednesday with 4,350 athletes demonstrating first-hand their creed: “The heart knows no limits; everybody has a heart.” Wheelchair daredevil Aaron Wheelz showed the spirit in the opening act. As a countdown from 10 reached its end, Wheelz raced down a giant ramp and somersaulted in the air through a giant 0 on the stadium floor. That finished the countdown and shattered more stereotypes about what athletes with disabilities can do. The president of the International Paralympic Committee, Philip Craven, made a similar point with his speech. Craven, who lost the use of his legs in a rock-climbing fall at the age of 16, reminded Brazilians they have their own problems to overcome. Craven suggested Brazilians follow the lead of Paralympians. “In a country which has faced major challenges of late, Paralympians will switch your focus from perceived limitations – to a world full of possibility and endless opportunity,” Craven said. “They will surprise you, inspire and excite you, but most of all they will change you.” Brazil is mired in its worst recession in generations. The country just removed its elected president, and these games needed a government bailout of almost $80 million to make it to the starting line. Craven also used the theme of “inclusion,” topical in a country often separated by the rich and poor, and black and white; a country with few provisions for wheelchairs or anyone with an impairment. “Show the world that there is no them, there is only us,” Craven told the capacity crowd at the opener. “A world where people of all abilities, races, nationalities and sexualities can come together as one. We are all part of one world.” The symbolic cauldron was lit by Brazilian swimmer and wheelchair user Clodoaldo Silva as rain fell. The six-time gold medalist faced a flight of stairs and looked perplexed about what to do next. The staircase then opened, exposing a ramp leading to the cauldron. Problem solved. Silva received the torch after a number of athletes carried it in the stadium. Among them was former Brazilian Paralympic medalist Marcia Malsar, who wobbled and fell over backward as she carried the torch across floor with aid of a cane. Malsar got back up, with some assistance, and finished her roughly 30-meter section of the relay in an effort warmly acknowledged by the crowd. The show featured a tribute to the wheel, to Brazil’s swirling samba rhythms, and to the beach – a ritual gathering spot in Rio. And there was the cast applauding an imaginary sunset, another ritual in this beach town. The show also saluted Brazilian swimmer Daniel Dias, the country’s most decorated Paralympian with 10 gold medals – and surely more to come in Rio. Organizers say tickets sales have been booming. Only 200,000 were sold a few weeks ago, but they’ve now sold 1.6 million. The goal is 2.4 million. This is partly a result of the reasonable prices for many tickets, only 10 Brazilian reals ($3). A notable absentee was International Olympic Committee President Thomas Bach. The IOC chief said he had to miss the ceremony to attend a state mourning ceremony in Germany for Walter Scheel, the former West Germany president. Craven told reporters it’s the first time since Salt Lake City in 2002 that an IOC president had missed a Paralympic opening. Patrick Hickey, a high-ranking IOC member from Ireland, was among 10 people charged by Brazilian prosecutors on Tuesday with ticket scalping, conspiracy and ambush marketing related to last month’s Olympics. Police investigators said they wanted to speak with Bach about email exchanges he had with Hickey related to ticket allocations for Ireland. Police had planned to “summon” Bach if he came for the opening ceremony, though there is no evidence he knew about the ticket scam. Also missing were 267 Russian athletes who were banned because of alleged state-sponsored doping. Officials say 159 nations were entered on Wednesday, and in addition a refugee team.